The Drummond brothers were notable amongst Sottish engineers in that both of them became Locomotive Superintendents. Dugald, the eldest, has always been lauded as an outspoken and very capable engineer, so much so that his brother, Peter, has been somewhat overshadowed. Strangely, their life stories have never appeared in biographical form. This book is intended to put that right. They worked closely together for almost 20 years in Scotland before an opportunity in Australia came Dugald’s way. After this event, which turned out abortive, their careers followed separate paths: Dugald for a short while as an industrialist in Scotland followed by a return on the railway scene in England, and Peter climbing to the top of the ladder in Scotland. Their respective careers are treated separately after coverage of their times together and their locomotive achievements on both sides of the border covered along with their individual family lives to give a comparative picture of English and Scottish pre-Grouping railway life. Researching this biography has flushed out several hitherto unpublished facts which give a good account of the brothers respective backgrounds. Dugald comes across as not only outspoken and blunt but with a strong streak of humanity and understanding when needed. Peter was a disciple of his brother’s ways but not afraid of going his own way once the strong influence of Dugald had faded. 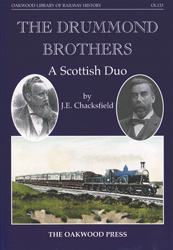 It is hoped that this biography will plug a gap in railway history associated with a pair of capable Scottish engineering brothers. A5 format, 168 pages, 150 illustrations.